Let’s first address the elephant in the Thai forest – is The King and I massively racist? I never thought I would agree with Mark Shenton (ok, apart from when we both liked Chess), I also find that ‘problematic’ is often a mealy term. You should have the balls to say what the problem is. However, I also think it’s a cop-out to dismiss attempts not to be racist, sexist, or gratuitously violent as political correctness, and to claim that a piece is redeemable simply through being a product of its era. As a precocious, irritating child (yes, yes, nothing’s changed), I would watch three videos on repeat: The Last Unicorn*, The creepy animated version of David Copperfield** and The King and I. I could never understand why mum, who had extreme tolerance of various singing animals in medieval costumes, couldn’t stand my rewinding of the best scene: ‘Small House of Uncle Thomas’. Sorry mum, I get it now. Except ‘Small House of Uncle Thomas’ is an interpretation by white men of how a young, Burmese woman in the 19th century would have interpreted Uncle Tom’s Cabin, itself an interpretation by a white woman of the experience of slavery. And while, like abolitionist Harriet Beecher Stowe, I think Rodgers and Hammerstein had nothing but good intentions, a limited lens will always ‘other’ and exoticise the people and culture being viewed through it. Bartlett Sher’s production, first seen at Broadway’s Lincoln Center in 2015, is commendably self-aware and boasts a brilliant, largely East Asian supporting cast. But again, is made by an almost entirely white creative team. Many clever tweaks have been made to try and pull the show into the 21st century. This includes giving the King’s head wife Lady Thiang (Naoko Mori) back some agency of her own, and allowing the rest of the wives to be knowingly comedic – we’re laughing with them, not at them, in reinstalled song ‘Western People Funny’. The production also turns ‘Getting to Know You’ into a ditty about cultural exchange, with English school teacher Anna (Kelli O’Hara) and her pupils swapping dances. The sexiest man on the London stage™ Ken Watanabe makes a mischievous king, kidding around affectionately with his many, many children. His childishness is purposefully playful, as opposed to evidence of his incivility. His burgeoning flirtations with Anna are sweet and humorous, and utterly, utterly dreamy. Kelli O’Hara is a vision. On paper, Anna is a widowed, prim paragon of Victorian colonialist values – she doesn’t sound like a heroine to root for. And yet O’Hara will have you rushing out to buy a crinoline. ‘Hello Young Lovers’, a usually rather dry ballad to her dead husband and the English countryside becomes a giddying celebration of youthful infatuation. I was lucky enough to be sitting in the £100+ stall seats (that’s a whole other rant I don’t have the word count for) to see her eyes shine up close. Mate, I was crying. It’s a sumptuous show, right from the very first scene where designer Michael Yeargan wheels on a full-scale boat for a grand total of about ten minutes – as if to say BECAUSE WE CAN. Catherine Zuber’s costumes drip with exquisite detailing that for the most part avoids too-horrible orientalist cliché (yes Chess‘s ‘One night in Bangkok’, I’m looking at you). The polka ‘Shall We Dance?’ is still the most romantic thing I have ever seen in my life. The swirling lavender taffeta as O’Hara hitches her dress in one hand, Watanabe shedding his shoes to better bound her across the ballroom -in and out of the pillars in a delicious, decadent whirl of delight. I wish she could sweep away all that is ‘problematic’ about this show in a swoosh of her skirts. But although The King and I can never be totally divorced from its racist roots, in this production there is at least a trial separation. To paraphrase Lady Thiang, revivals will not always say what you would have them say. But now and then they will be Something Wonderful. 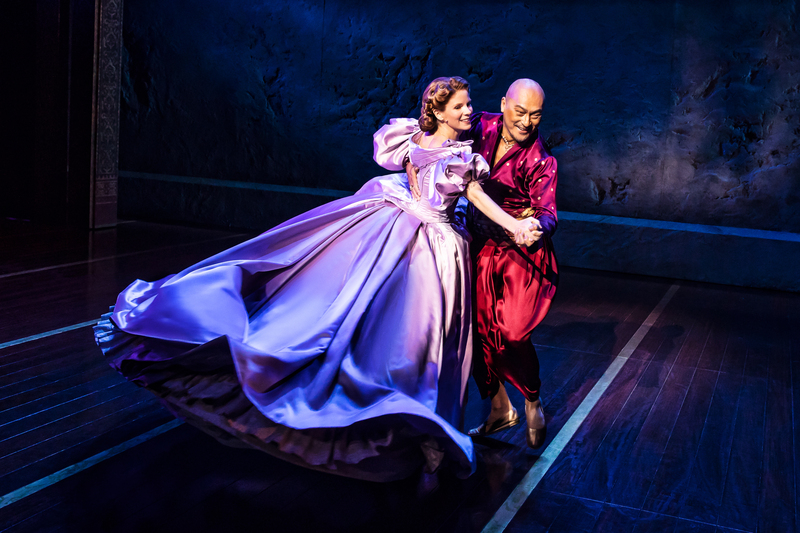 The King and I is on at London Palladium until 29th September. More info here. * WHY ISN’T THIS A WEST END SHOW YET? It would be amazing, the songs are so good, it has a deep feminist message, and imagine what a designer could do with a flaming bull and a sea of unicorns. **If you have never seen this amazing 90s wonder– where Copperfield is a cat voiced by Julian Lennon who works in a cheese factory overseen by a terrifying vulture, you are missing out. Don’t adapt it for stage though, you’ll never manage to get the orangutans right.